Superman Tribute 2 Face plus Face Cover. Superman Tribute 2 different central face images And Face cover just showing Superman logo. 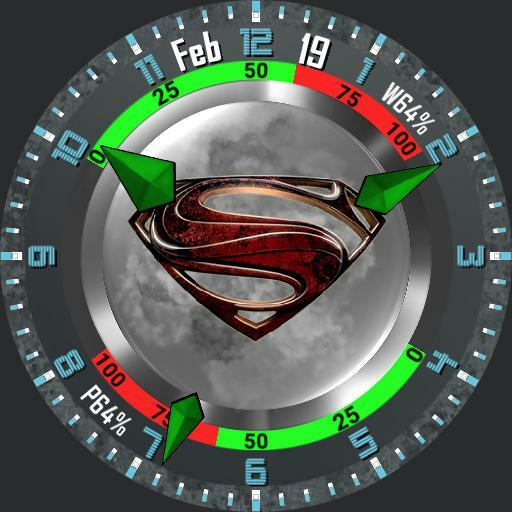 Analogue time, fliating Kryptonite hands, hour, minutes, smooth seconds, outer bezel top left, short month, top right, day number, and outer ring also actual power levels, curved inner ring, approximate power levels for watch and cell. Tap actions, mid left next ucolor, mid right previous ucolor, tap centre to change faces.